The AcousticCurtain™ is the industry standard to keep noise from coming into your home. We now offer pre-sized curtains; these curtains are less expensive than our custom-made curtains and are able to be shipped more quickly. We’ve selected the most popular sizes and colors and have made them available below. All of the same features are included — noise-blocking curtains that also have light-blocking and thermal insulating properties. Enjoy the peaceful silence of relaxation! 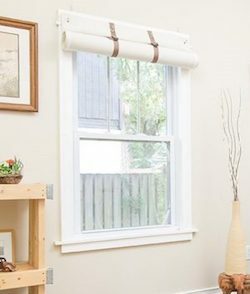 Don’t want to wait for a customized curtain? We offer a number of pre-sized curtains that are in stock and can ship within 3 business days from the time of your order. Select your size and block out the sound now! If you would like a different size, color, or other modification, you can also order a custom AcousticCurtain™. The Standard-Sized AcousticCurtain™ is identical to our customized product, but can be shipped within 3 business days. You can return the Standard-Sized AcousticCurtain™ if you find it unsatisfactory. Just ship it back to our location, and we will inspect to make sure it’s in good condition. We will refund you the price of the curtain, minus shipping and a $25 restocking fee (to re-attach Velcro and re-package the curtain). My wife and i visited the small warehouse/factory in Tampa. The owner took the time to explain the product and its development.Got a chance to look at the materials. Friendly people.Willing to listen to new ideas and always trying to improve on the product. We are happy with the sound proofing quality of the product we bought.